Kanyakumari (Cape Comorin) is a village barely 90KM away from my home. It is a tiny Tamil village located at southernmost tip of India and what makes it unique is its location. It is the meeting point of three oceans, namely Indian ocean, Arabian sea and Bay of Bengal sea. And if you are at the southernmost spot in Kanyakumari, you will see ocean on the left, right and in front. It is a unique experience to be at that point! When you look back, you will see the last stretches of Western Ghat which separates Kerala from rest of India. Kanyakumari is a popular picnic and tourist spot and a large number of people visit the place to see sunrise and sunset. It is supposed to be the best place to watch sunrise! 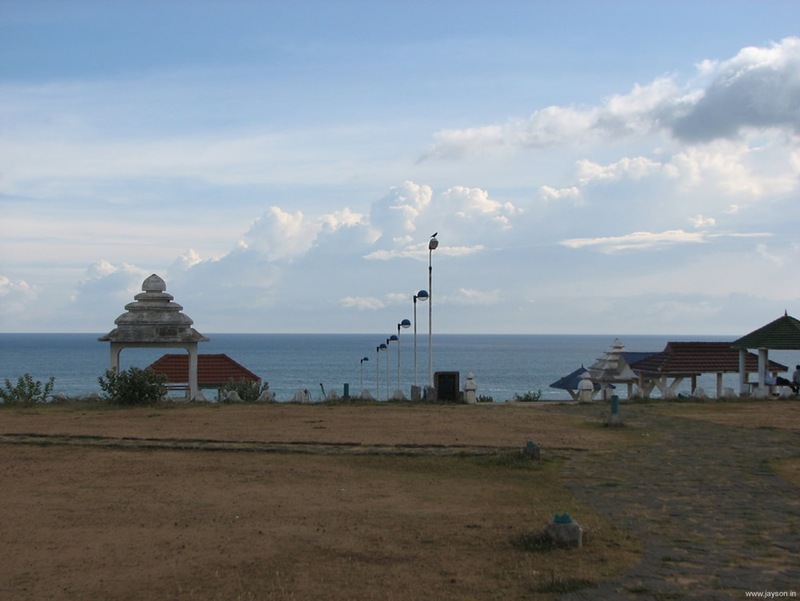 Other attractions at the Kanyakumari beach include the Vivekananda rock memorial, Mahatma Gandhi memorial, Thiruvalluvar Statue on the rock, Kanyakumari Bhagavathy Amman temple, road side shopping and Tsunami memorial. There are also a number of interesting places to visit around Kanyakumari. Nearest airport is at Thiruvananthapuram. Main Kanyakumari temple is dedicated to Devi Kumari (Kumari Amman Temple) and it is over 3000 years old. 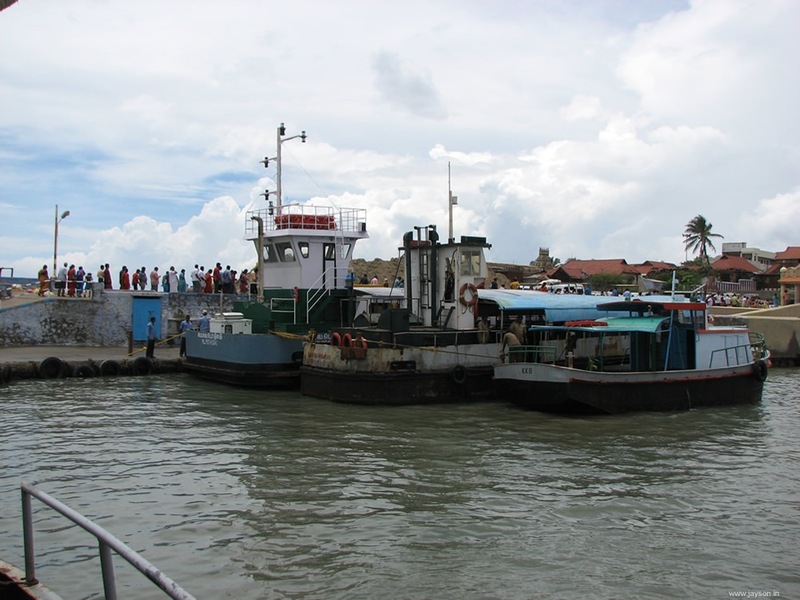 During peak season, the ferry service to Vivekananda rock memorial is used by over 10,000 tourists per day! Sunrise is visible throughout the year in Kanyakumari, but sunset is visible only from October 15 to March 15. 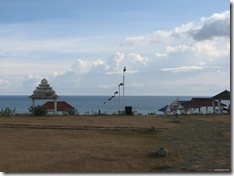 From the hillock called Murugan Kundram (3KM from Kanyakumari), both sunset and sunrise is visible throughout the year. Full moon day of April is the best day to visit Kanyakumari (Chithra Pournami). Swami Vivekanandan attained enlightenment while meditating on the Kanyakumari rock in 1892. Vivekananda memorial was constructed in 1970 and it took 650 men and 2000+ days to complete construction. Mahatma Gandhi visited Kanyakumari in 1925 and 1937. There is a Gandhi memorial on the beach side. Of late I have become a travel addict. So when I got another weekend, the only thing I did was to plan a getaway for 2 days. This time I decided to drive to Kanyakumari (90KM away) and stay there for a night. The idea was to visit Kanyakumari, catch the sunrise and sunset and also visit nearby tourist places in Kanyakumari. My cousin and his family also joined us for the trip. It was almost 4PM on Saturday when we started from Trivandrum to Kanyakumari. My plan was to cover 90KM in two hours and reach Kanyakumari just in time to watch sunset. But soon it turned out that it is an impossible dream. The national highway (NH 47) from Trivandrum to Kanyakumari was heavily crowded and overtaking was near impossible on the narrow two lane road. Added to the mix is the suicidal jaywalkers who will simply jump to cross the road. 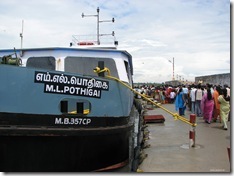 It would take at least 4 hours to reach Kanyakumari (crossing Nagercoil town was a nightmare!). 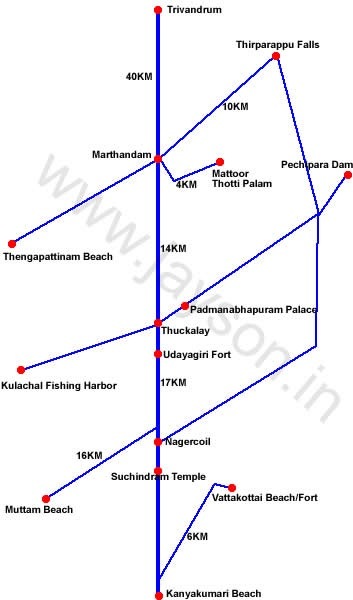 Major towns on the NH 47 which connects Trivandrum to Kanyakumari are given below. The distances are approximate. There are two check posts on the way, one on the Kerala side at Amaravila and the second one at Kaliyikkavilai on the TamilNadu side. Normally private vehicles are not stopped. There is also a toll bridge at Amaravila (which crosses Neyyar river). One way toll fee for cars is Rs. 3. If you are driving at night, beware of the unmarked bumps on the Amaravila-Kaliyikkavilai stretch! There are a number of restaurants at Kanyakumari. But since it is a busy tourist place, most of these are prohibitively expensive and the food is horrible. So it is better to have food outside Kanyakumari (which obviously is not possible if you plan to stay there for sometime). Check out the following map for the route. It is better to keep a print out of this if you travel by car. Parassala is the last town on the Kerala side and from Kaliyikkavila TamilNadu jurisdiction starts. Road signs for Kanyakumari are seen throughout the NH 47. But once you cross to TamilNadu, the signs are so small that you will have to stop your car to read it! Obviously someone was paid on the number of signboards, not based on the size of the sign board. This is the curse of India – corruption is everywhere. Crossing the Nagercoil town is a nightmare. It took almost 30 minutes just to cross the town and it is easy to get lost in the town traffic and one way lanes. In some places road signs are put up after the junction! When in doubt, check with someone on the road before you drive around in the wrong route! It was almost 8PM when we reached Kanyakumari. The last stretch of road to the Kanyakumari beach is well maintained. Suddenly someone jumped in front of the car with a flag in his hand. I had to apply sudden brakes to avoid hitting him. The guy was stopping us to collect Toll! Kanyakumari Town Panchayat realized that it is easy to make money by putting up an entrance fee and leasing the collection to someone else. But since there is no check post, they have to jump in front of the car to collect the toll! The toll is Rs. 25 for a car. After paying the toll we went to the beach stretch of the road. Since it was dark, there was nothing to see and drove back to the hotel we had booked. There are a number of hotels right at the beach side. The daily room rent varies from about Rs. 500 to about Rs. 5000. A room with sea view invariably costs more and it is difficult to get one during season. October was the season for tourists from north India and hence we had difficulty in getting a sea view room. Even in the costliest hotels food is horrible. So the better option will be to settle for simple south Indian food. Also stick with bottled mineral water. Following are some of the high end hotels I could find in Kanyakumari. There are also a large number of budget hotels, but it is difficult to know how good they are. Check out this page for a complete list of Kanyakumari hotels. When you reach there, you will be approached by hotel agents who work on a commission. If you are not careful, you may end up paying more than the actual room rent! Vivekanandapuram (head quarters of Vivekananda Kendra) provides good accommodation and has beach access. It is located about 1KM from the main beach. 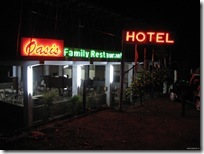 This is one of the most popular hotels in Kanyakumari. It is located away from the main beach and has a total of 76 rooms. A standard AC double room will cost about Rs. 1500. For more details and contact us including phone number check out the official Hotel Singaar Web site. This is where we stayed and is the closest hotel to the bay of Bengal beach. But there is no direct access to the beach and you will have to pay about Rs. 500 extra for a sea view room! Rooms and food here are very costly and you may not like the food. A suite which contains two double rooms (two families) cost us Rs. 4500! There is a pretty good bar on the ground floor of this hotel. You can see sunrise from here and it also has the best view of the east coastline. 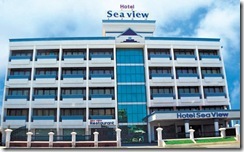 For more details and reservation, check out the official Kanyakumari Hotel Sea View Web site. Hotel Samudra is located just behind the Kanyakumari temple and is just few Metres away from the boat jetty. It has both AC and non AC rooms and is cheaper compared to other hotels. Phone number is 04652-246162. Trisea is probably the only quality hotel from where you can see both sunrise and sunset (not sure about it though). It is located on the other side of the main road (which goes to Kovalam) and has sea view rooms. This place also has a large conference hall. Please check official Tri Sea Web site for more details. I have prepared the Kanyakumari map using Google satellite map and have marked important places. As you can see, the tourist spot is located on the east side of the tip and it is not the southernmost spot. To catch the southernmost spot you will have drive through the beach side road for about 1 KM. STD Code for Kanyakumari village is 04652. 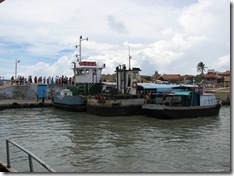 The ferry service starts at 7:30AM and it closes around 4PM. There is always a long queue and the queue is small in the noon. You have to pay Rs. 20 for the boat service and then another Rs. 10 at the Vivekananda rock. The two ticketing system is nonsense since after reaching the rock there is no other place to go! At the Vivekananda rock, there are two "mandapams" – one on the top which has a giant statue of Swami Vivekanandan and the other on the bottom of the rock houses the "the sacred feet" of Devi Kumari. Toilet facilities and a small bookshop is there on the rock. 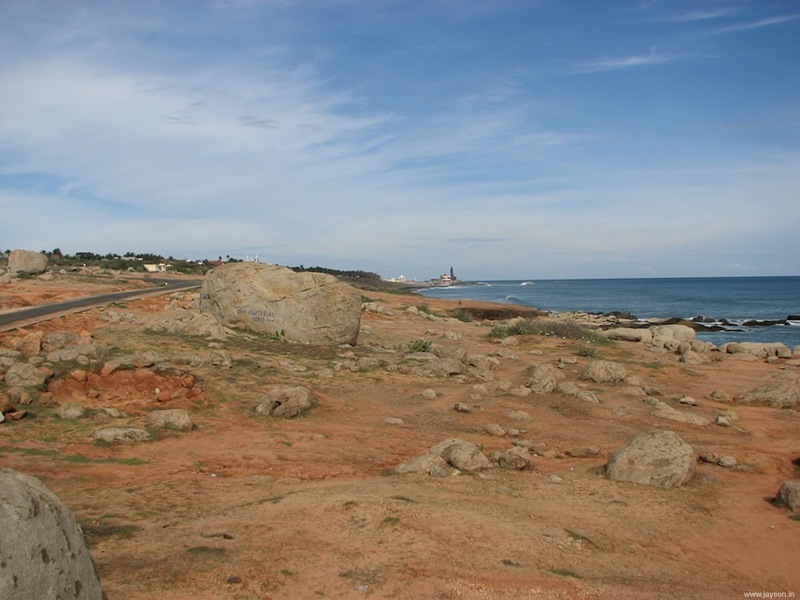 The view of the Kanyakumari coast from the Vivekananda rock was the high point of the trip. The rock is jam packed with pilgrims and tourists at all times. Currently you cannot visit Thiruvalluvar statue rock since it is closed for enhancements. Driving along the Kanyakumari beach road is an unforgettable experience. There are very few tourists on this stretch and you can walk down to the rocks on the sea shore. 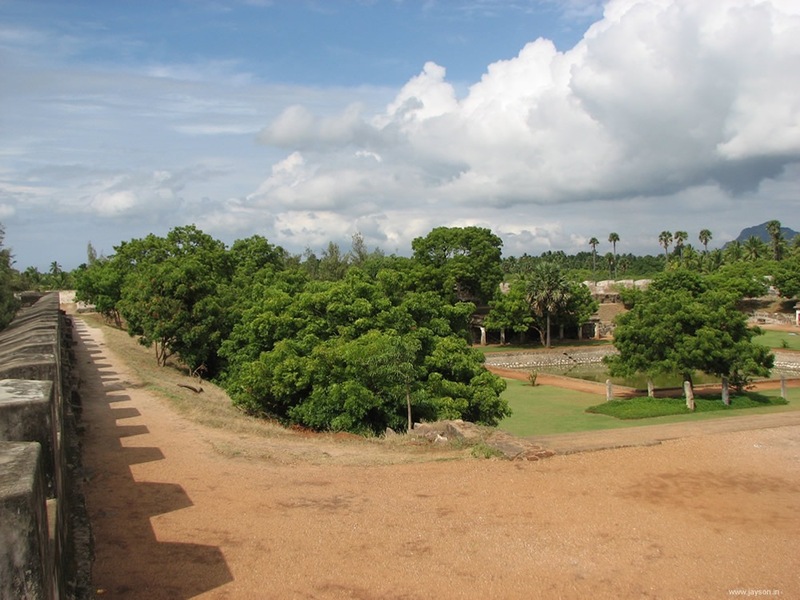 On the right side of this road you will find the abandoned ITDC project called – "Kanyakumari sunset point". It was built to make it a busy tourist spot, but abandoning the project (I guess due to political reasons) has preserved the natural beauty of the coastal line. The beach road later joins the main road which leads to Kovalam (this is different from Kovalam in Trivandrum) and Agastheeswaram. If you drive through this road you will come across salt lakes (uppalams) which extract salt from sea water. Baywatch water theme park is also located on this road. 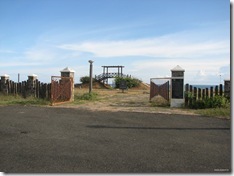 The above panorama shows the southernmost tip of India. It is this point which separated from "Gondwana" continent about 150 million years ago! (if we believe Geo-physicists :-)). on the left you can see the Thiruvalluvar statue as a small dot! 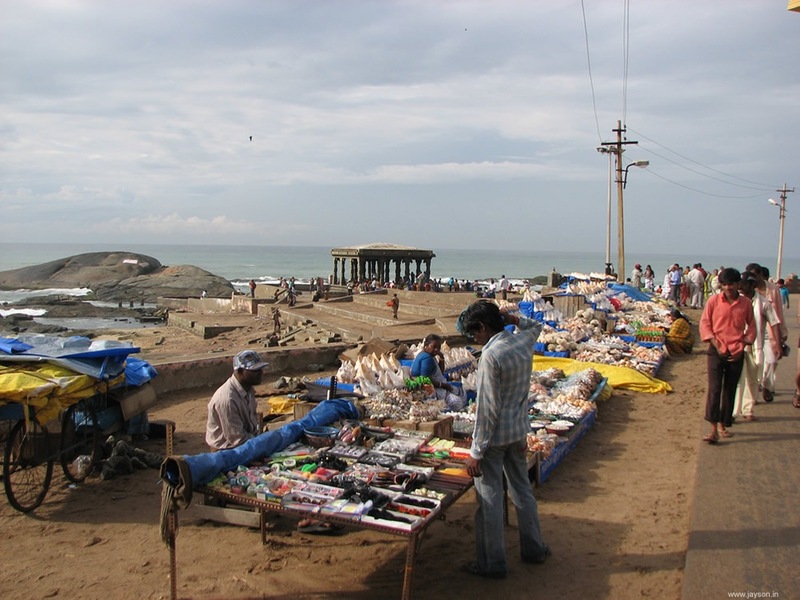 Kanyakumari offers a wide range of shopping options and you can get sea shells, pearls, clothes, wood items, paintings and handicraft items. Everything is cheap – for example a hand made hat costs as little as Rs. 10! But if you are a foreigner or a tourist, you will find that the shop keepers tell you a different price! So it is a must to haggle on the price if you want to get it cheap! We purchased hats, cloth bags and bamboo paintings from there. Buying a hat is a must if you plan to walk around the place. 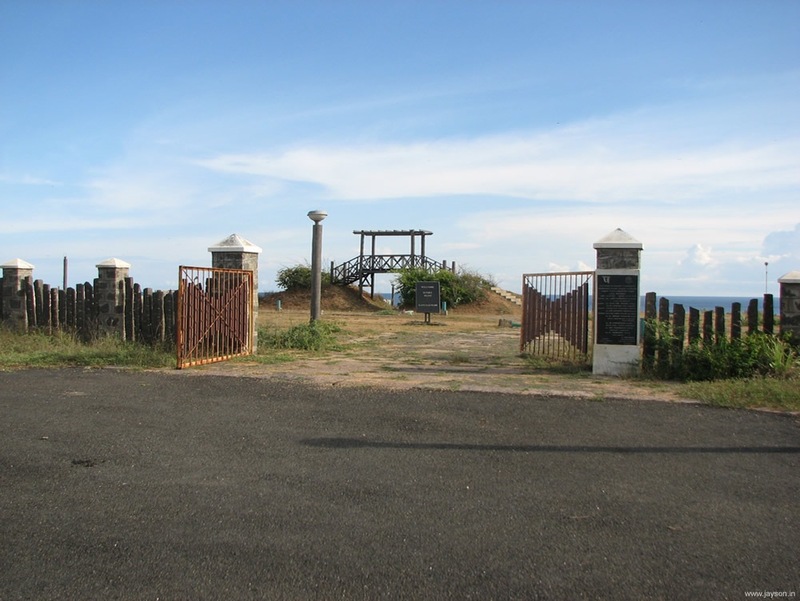 Vattakkottai beach and fort is located about 6KM from Kanyakumari beach. When you drive back from Kanyakumari, take the right road at the first "V" junction and drive about 5KM for the Vattakkottai diversion. You need to take a right turn and the fort is about 1 KM from the main road. Even here toll is collected by an old woman for Leepuram Panchayat (Rs. 15 for car). 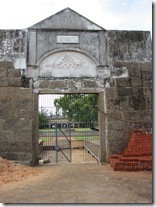 Vattakottai Fort was built in 18th century by the Travancore king Marthanda Varma for defending coastal areas. It was designed by the Dutch captain De Lannoy and is an interesting fort extending to the sea. Fort sides are flanked by beaches and you will rarely find people at the beach. So most of the time it is like being in a private beach! From the top of the fort you can see the bay of Bengal in it full glory. If you look to the other side you can see the last of the Western Ghat mountains. It is an ideal place for an evening picnic. 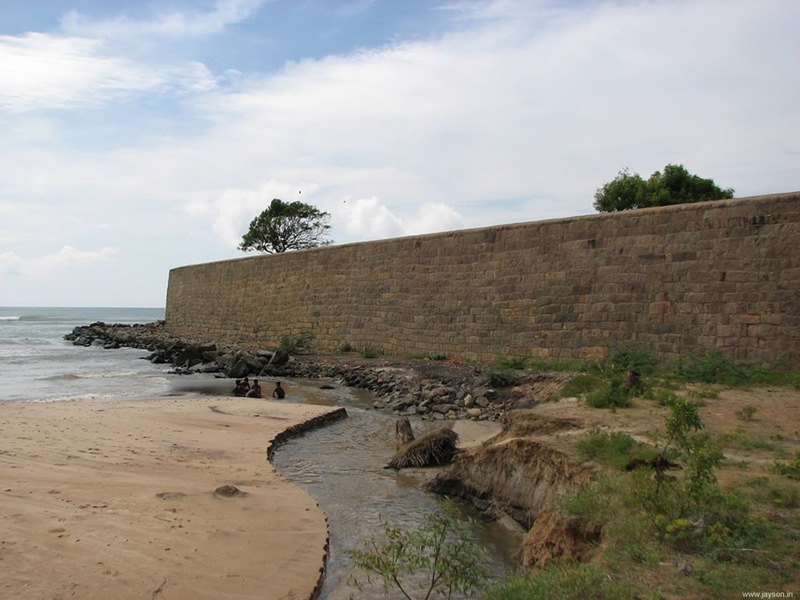 A small river joins the sea on one side of the Vattakottai fort. 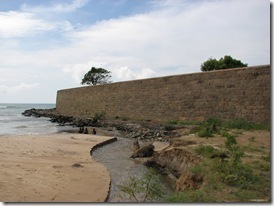 It is possible to walk to this side of the beach via a small road located a few Metres from the Fort entrance. During rainy season it may not be easy to cross the river to go to the beach. 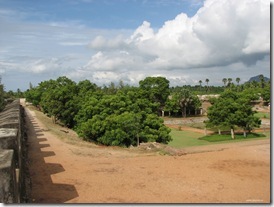 Following panorama shows the view of Bay of Bengal and Western Ghats from the top of Vattakottai Fort. There are a couple of interesting tourist destinations around Kanyakumari. Following are the major places you should include in your tour itinerary if you are planning to stay couple of days in Kanyakumari. Muttam beach – Muttam beach is about 32KM from the Kanyakumari coast (16KM from Nagercoil) and is on the western coast. The sea here is quite rough and giant rocks extend from coast to the sea. There is also a lighthouse at Muttam beach. At some areas Muttam beach is dangerous and at some places fencing is done to protect tourists. Muttam beach is quite popular locally. There are a number of small open huts built on the seashore and you sit and relax there. It is fun to watch waves hitting the rocks. Muttom beach is usually jam packed during weekends. The sunset is a breathtaking view from Muttam beach. Padmanabhapuram Palace – The Padmanabhapuram palace and fort is located about 50KM from Trivandrum and 40KM from Kanyakumari. It is very near to Thuckalay. There appears to be a 4 feet tunnel which connects the palace to the Vattakottai fort on the eastern coast. But we couldn’t see it on our trip. This palace is more than 400 years old and it was built by the Travancore King Iravipillai Iravivarma Kulasekhara Perumal. The stone work/wood work in the palace is impressive. There are a number of small hotels and souvenir shops in front of the palace. Mattoor Thotti Palam – Mattoor (Mathur) Thotti Palam (Hanging bridge) is the Asia’s longest/tallest through bridge (Aqueduct). It was built to carry water from from one hill side to another. It crosses Parazhiyar river. The water channel is at a height of 101 feet and the total length of the channel is over 1KM. It is supported by 28 giant pillars. The water canal has a depth/width of 6 feet. The views from the top of Mattoor Thotti Palam is impressive. Thirparappu Water Falls – Thirparappu water falls is a beautiful and elegant waterfall on the Kodayar river. It is a very popular tourist destination and is jam packed at almost all times! Thirparappu waterfall is located about 60KM from Kanyakumari and about 10KM from Marthandam. The waterfalls is about 300feet long and drops to a depth of about 50 feet. There is also a small swimming pool near the waterfalls for children. There is also a temple dedicated to Lord Mahadeva nearby. Petchi Parai Dam – Pechiparai dam is located about 40KM from Nagercoil. 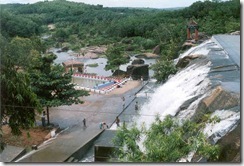 It is built across Kodayar river and is at the downstream of Thirparappu waterfalls. There is a camp shed for tourists. 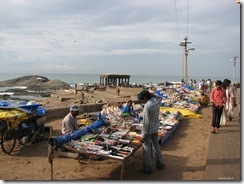 Vattakottai Beach – Vattakottai Beach is located about 6KM from Kanyakumari on the eastern coastal road. Once at the Vattakottai fort, you need to walk about 500 Metres through a narrow road on the left of the fort to reach beach. You will also have to cross a small river to reach the beach front. Very few tourists come here and in the morning you will get your own private beach! The waves are calm here, but the beach inclination is sharp so don’t venture too much into the sea. Also if something happens there won’t be anyone to help you! Check out the panorama view of the Vattakottai below. On the right you can see the Vattakottai fort and to the left of it is the Kanyakumari coastline. Udayagiri Fort – Udayagiri Fort is located about 14KM from Nagercoil and about 33KM from Kanyakumari. 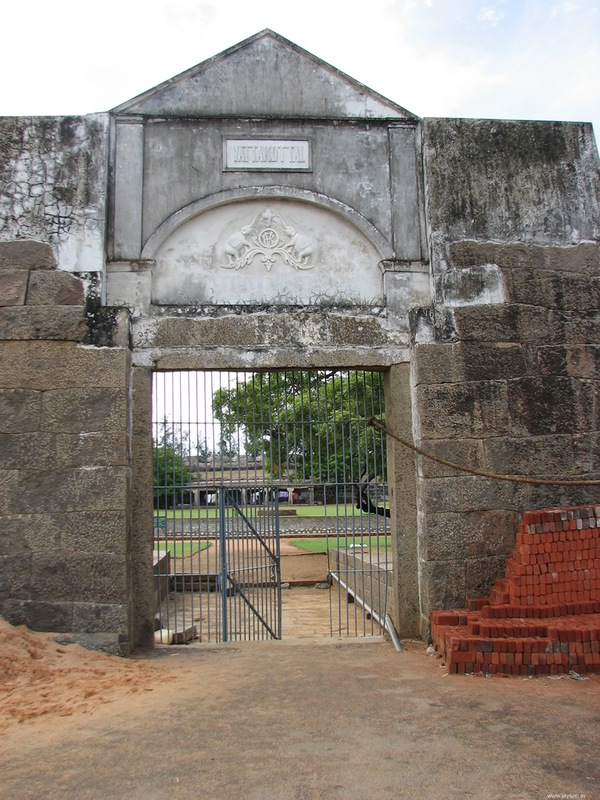 It was built in 16th century and later in 18th century was rebuilt by Travancore king Marthanda Varma. It is located on the NH47 and hence you can visit it while travelling to or back from Kanyakumari. Suchindram Temple – Suchindram temple is located about 7KM from Nagercoil and about 11KM from Kanyakumari on the NH47. The darshan timings are from 4:30AM-12:30PM and 4:30PM-8:30PM. Cameras and mobiles are not allowed inside and you will have to deposit them outside (It is better to give it to someone in your team and take turns to visit the temple). You will have to take of you shirt to enter the temple. Beware of beggars and guides here – they attempt every trick in the book to get money from you! Government Fruit Farm – There is a government fruit farm located about 2KM from Kanyakumari. It is supposed to be open to public from 9AM-11AM and 1PM-3PM (except Saturday/Sunday). I couldn’t visit this place due to lack of time. Maruthuva Malai – Marunthuvazh Malai (Maruthuva Malai) is a small mountain stretch located about 11KM from Nagercoil and about 8KM from Kanyakumari. Maruthuva Malai is part of the Western Ghat and is visible from the NH47. Most of the mountain areas are owned by private parties. The word Maruthuva Malai is the short form of "Marunthu Vazhum Malai" which translated means "Mountain of Medicinal Plants". According to legends when Lord Hanuman was carrying Sanjeevani mountain to Sri Lanka a portion of it fell here to become Maruthuva Malai! Maruthuva Malai stretch is over 1KM in length and the highest point is over 800ft. Being at Kanyakumari is exciting just because of its geographical location. But when you visit Kanyakumari, plan your trip and visit the surrounding interesting places such as Vattakkottai Fort, Kovalam/Muttam beach and the sunset spot. 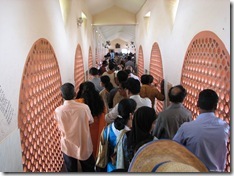 this site is very usefull for tourists visiting kanyakumari. 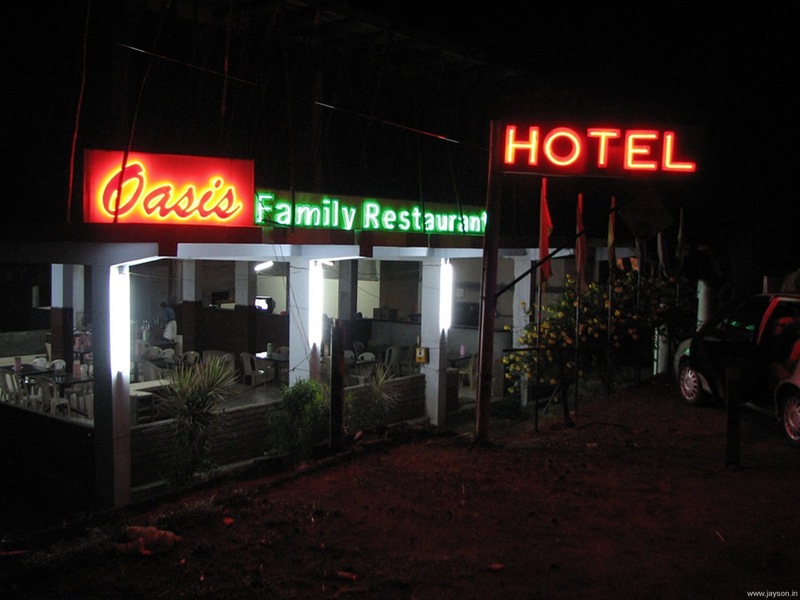 Thanks for the efforts you have made and many more thanks for mentioning oir Oasis family restaurant. My wife is the proprietor of the restaurant. Thanks for all details, I am planning to visit there in January and found good information from ur experience. thanks a ton for giving so detailed info about Kanya Kumari. I am planning to organise a trip in the faimly for about 50 people (hiring a bus), all the info given in there have been really helpful. 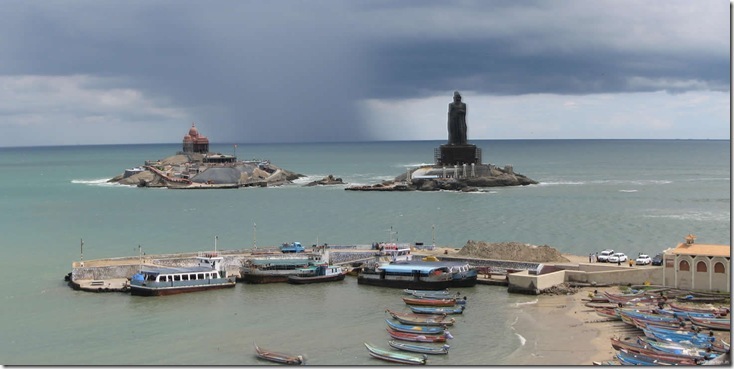 good information about kanyakumari , one more info ,what is the time required to complete ? 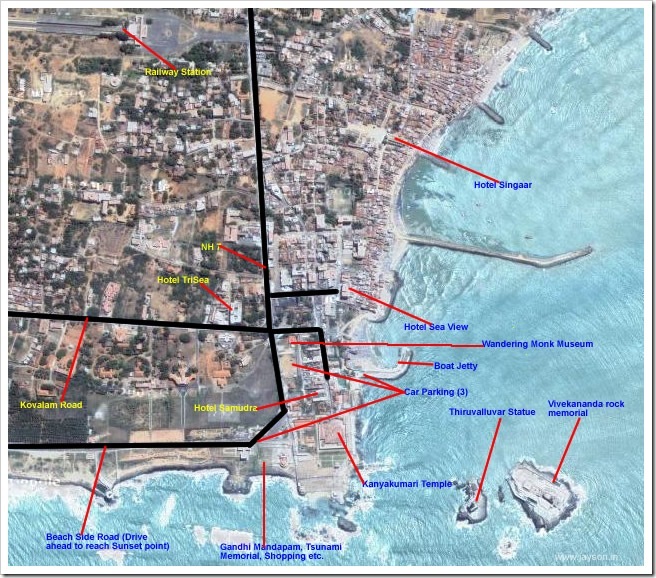 good information about kanyakumari,one more info, how long it take to cover the places. sir, thanks for ur valuble information to visit kanyakumari, hatsoff. Wonderful explanation. I appreciate the time and effort you’ve put in publishing this. Excellent travel guide. Tomorrow I’m planning a journey to Nagercovil. More after the trip. Will make my trip this August hassle free. Wow, havent read a more comprehensive review in many days! I will be reaching Trivandrum airport around noon,and have to be back at Trivandrum around 9pm. Do u think I can get a cab on hire which will take me to kanyakumari and back, and will the time be enough for the trip? 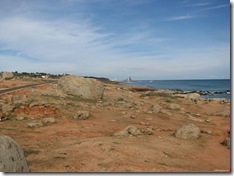 We visited Kanyakumari on 11 Dec 2011. The description given in this site was very useful for all the travel and logistics planning. The description found in this site really matches with the actuals. Very good effort. Very detailed and illustrative information. Thank you very much for the effort you put in. We plan to visit Kanyakumari tomorrow and this information will be very useful. My dear friend, Kanyakumari is not the southern most tip of India. It is Indira Point in Andaman and Nicobar. This misconception is because we fail to accept the A&N islands as part of India. The descriptive information is really useful for me since I am planning to visit Kanya Kumaryi during January 2013 . I will start from Delhi to Trivandrum and to Kanyakumari. So the information is vital to me . I would feel more helpful if the modes of transport and their rates were provided . I have to check the present rates of hotels stated in this paper to ensure its validity . However, I am again extending my thanks to the writer . thank u, jai.. i visited kanyakumari after reading ur tour report. its really amazing to be in kanyakumari. Thanks for experience sharing. It is highly appreciable anybody easily travel without hesitation and enjoy site seeing. Wonderful description. God bless you. 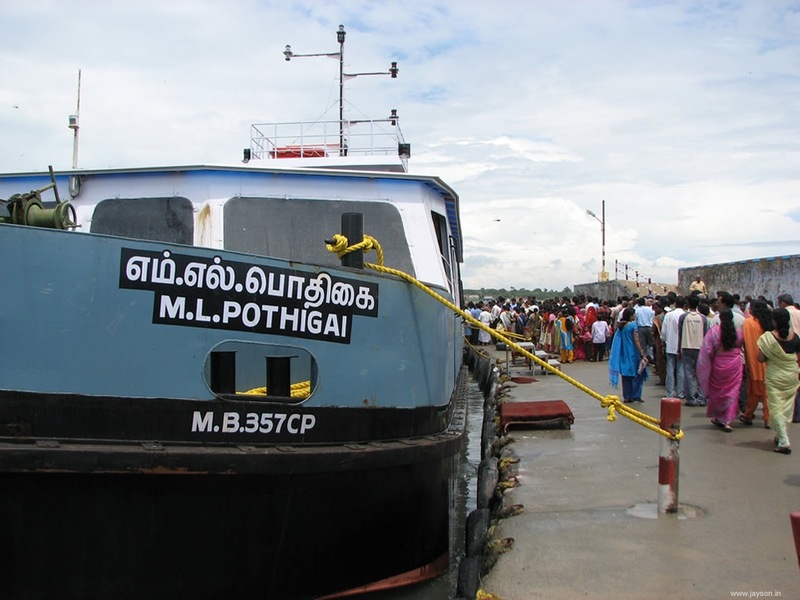 It eases the planning tourist who intend to visit Kanyakumari and nearby places. Pl give your mail address so that further doubts can be clarified. Thanks a lot for this info. Just came back from a visit with all details present here. Appreciate your effort to document the same.